Almost Almost Famous centers on three of the world’s top tribute artists in the middle of an intense, month-long Canadian tour. 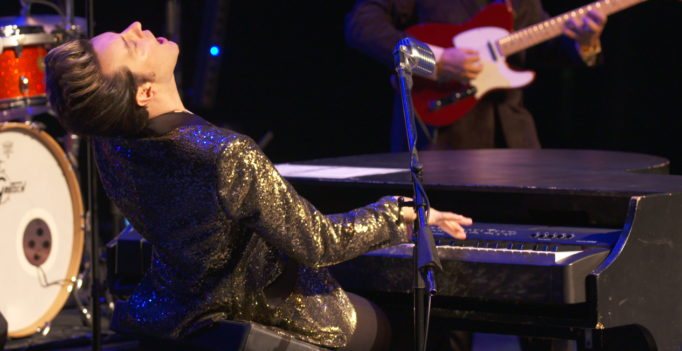 As the documentary unfolds, each musician reveals their story: how they became a tribute artist, the connection they have to the artist that they portray on stage, and their own career aspirations. Some, like the artist portraying Elvis Presley, are simply devoted fans themselves while others, such as the performer taking the roll of Jerry Lee Lewis, aspire to break out of the tribute world and make their own original music. At its core, this is a film that explores the (sometimes blurry) relationship between the artists as individuals and the musicians they portray on stage. When you are paid to look, sound, and move like someone else, how do you maintain your own identity? How do you rise to the top of a competitive industry while still maintaining boundaries between yourself and your work? The answer is different for everyone, and Almost Almost Famous makes an admirable attempt to relate these musician’s experiences and struggles to something deeper and more profound, but it never quite manages to get there. Part of the problem is that the focus of the film shifts from the artist’s personal stories to the drama of the tour and then back again a bit too rapidly. Almost Almost Famous can’t seem to decide if it is about this particular tour and the ups and downs of life on the road, or who these guys are when they wash out their hairspray. It could certainly be both but, with a runtime of under 90 minutes, it simply tries too hard to cover too much ground and never manages to get very far beneath the surface. That isn’t too say that Almost Almost Famous isn’t an interesting or enjoyable film. Just that if you want a documentary that will give you something to chew on (thematically, aesthetically, or otherwise), this isn’t it.